The Yang-style Taijiquan Baduanjin was originally an indoor family neigong of the Yang family�a secret weapon sorts. 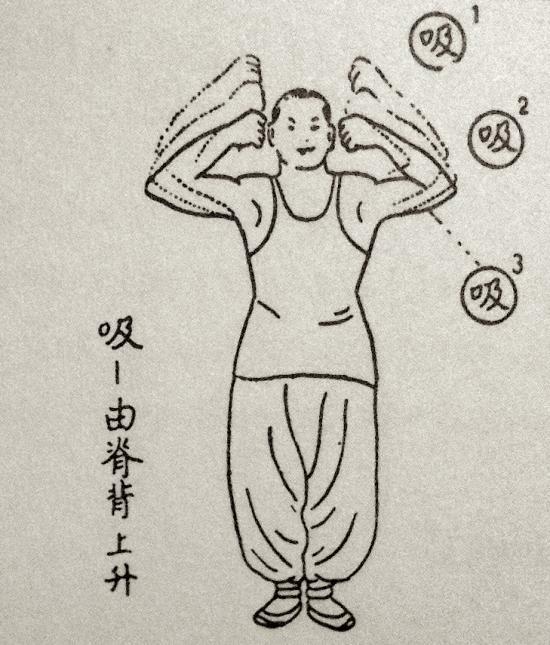 It can be seen variously as a good solid warmup and strength and flexibility practice or as an essential piece of the Yang-style Taijiquan curriculum. 'Baduanjin' (bādu�njǐn 八段錦) means �eight-section brocade� and connotes the side by side placement of different weaves of fabric seen, for example, in the robes of Emperors or monks. The term baduanjin first appears in Hong Mai�s �Records of the Listener� in the Song Dynasty (1127-1279). The Emperor�s Chief Secretary Li Siju is described as living a simple life which includes getting up at night to practice deep breathing, self massage and exercises called baduanjin. Today a standard set of baduanjin is practiced and is readily found in books and on the internet. The Yang-style Taijiquan Baduanjin is not related to the standard sequence. It originates with Yang Jianhou (楊健侯 1839-1917), or possibly his father Yang Luchan (楊露禪 1799�1872) and was passed to his disciple Tian Zhaolin (田兆麟 1891-1959). Most practitioners of the Yang-style Taijiquan Baduanjin today descend from the Yang-Tian lineage. Tian Zhaolin began a collaborative writing project with a martial arts enthusiast named Chen Yanlin which was later to be published in 1943 as �Taiji Boxing, Sabre, Sword, Pole, Sparring Compiled� (t�ij� qu�n dāo ji�n gǎn s�nshǒu h�biān 太極拳刀劍桿散手合編), but without Tian�s name attached.